Spring has sprung and the bush is changing. The evenings are becoming balmy, the Jackalberry trees are shedding their leaves making room for new growth, the Knobthorns are in full flower, and the migratory bird species are returning. This week we observed this metamorphosis along with the resulting adaptive behaviours of the animals, and had one particularly emotional and intense sighting which embraced the circle of life in a different way. 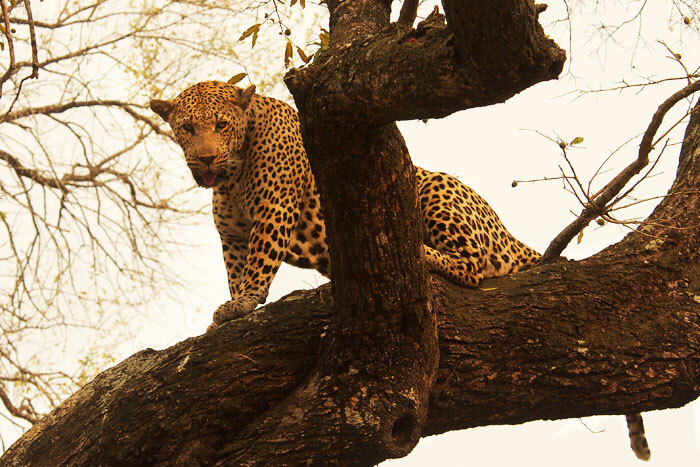 We were thrilled to find the Nyeleti 2:3 Young Male on Marthly earlier in the week. This 2 year old, the brother of the Nyeleti 4:3 Young Male and 3:3 Young Female, has not been seen for a while so when we found him lying at the base of a Lowveld Milkberry tree with a baby nyala kill hoisted in it, we welcomed his homecoming! 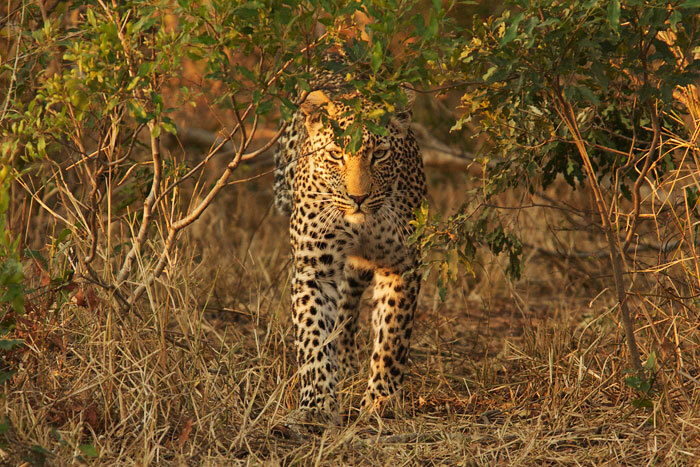 A few days later we were treated to a sighting of his sister, the Nyeleti 3:3 Young Female. 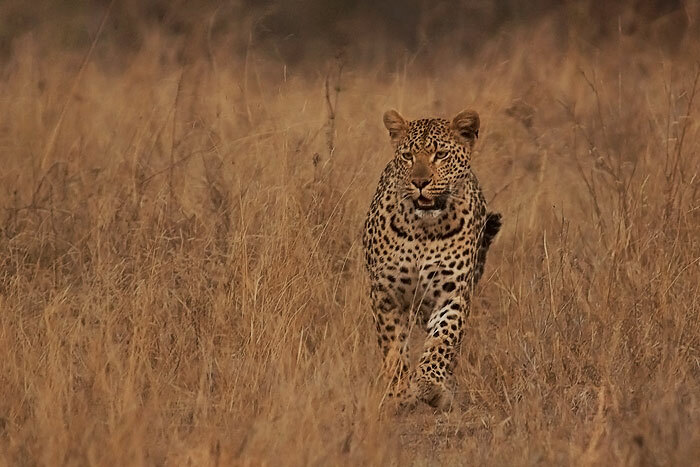 She hunted through the Guarri thickets around Nyeleti Pan, but was not as successful as her brother had been. The weather is getting warmer! 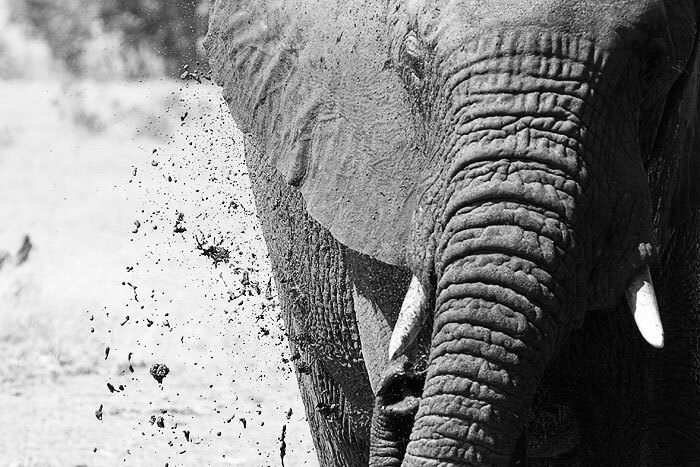 Here, a young bull elephant gives himself a cooldown with mud from Fluffie's Pan. 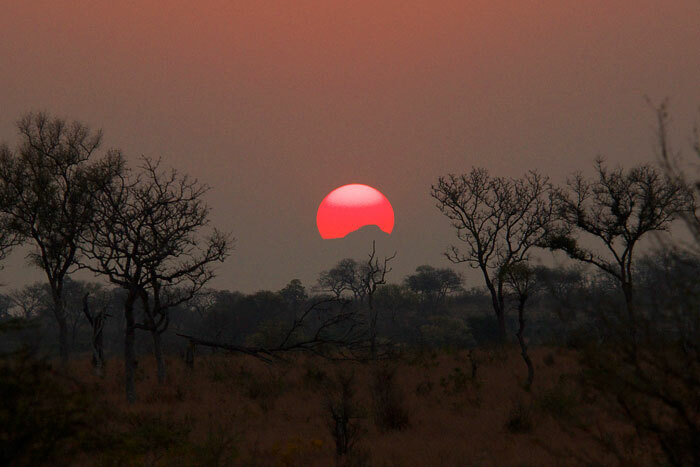 The dusk sun sets over the Lowveld Escarpment in a dusty haze. 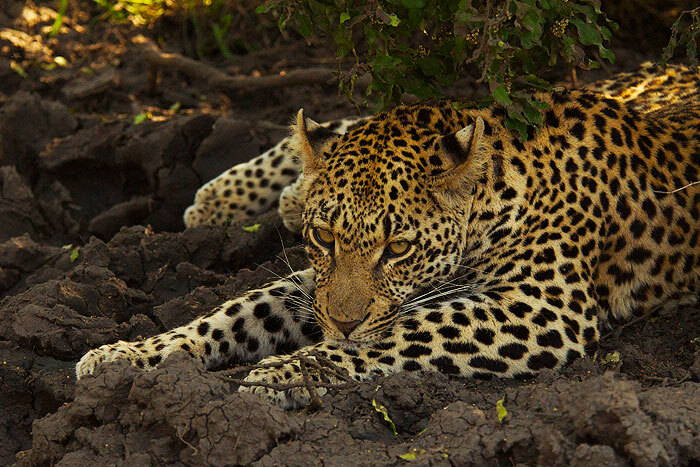 The Dudley Riverbank 3:3 Young Male sits at Gerts Pan under the Magic guarri bushes. Just as we were speculating why he would choose such a spot on the uncomfortable dried mud, a group of nyala approached to drink. He lay completely flat, and was so camouflaged in the dappled light that the nyala couldn't see him from about 3 meters away! Unfortunately, that 3 meters was filled with water - too big of a jump to catch one. 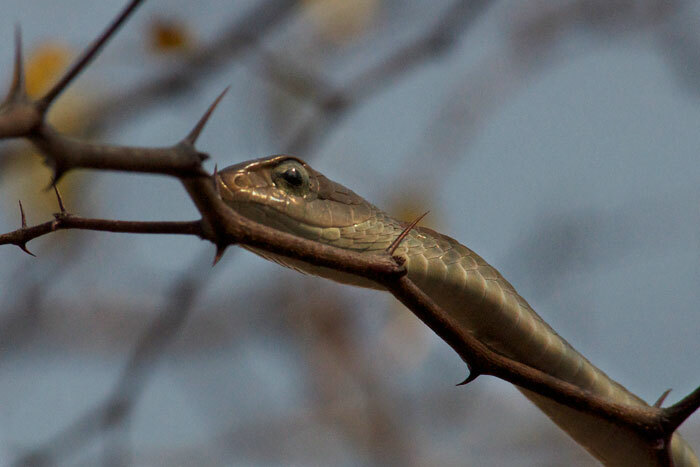 A female boomslang stretches out on a Buffalo thorn branch, a further sign that summer is upon us! Her ability to see stationary objects, as evidenced by her large eyes, differentiates them from most snakes who rely on smell and movement to detect prey. 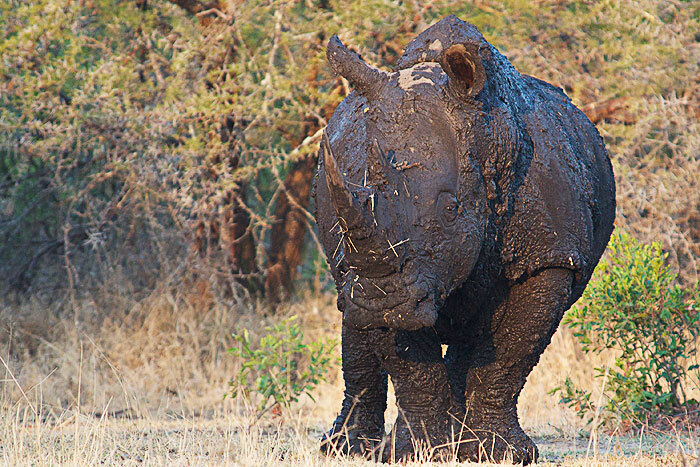 This White rhino seemed to be trying to disguise himself as a Black rhino by completely immersing himself in the mud. Notice anything strange about the elephant on the left? 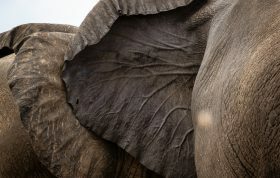 He only has about two thirds of his trunk. It is difficult to say what happened to this young bull who visited Camp Dam this week, but he has adapted well: other rangers reported seeing him feeding using his tusks to pry vegetation free, then picking it off directly with his mouth. He appears in very healthy condition! The Dudley Riverbank 5:5 Male makes an appearance near the Sand River, his facial scars clearly visible from his fight with the Marthly Male. 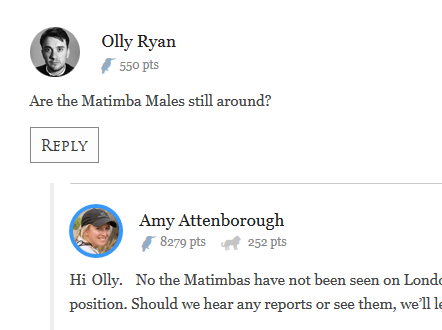 Old habits must die hard, as he was once again in the Marthly Male's territory. Lucky for Dudley 5:5, however, the older dominant male was not around. 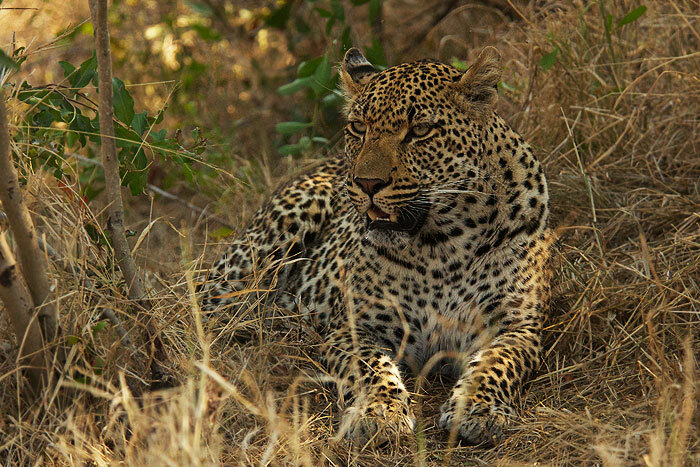 Just after seeing the Dudley Riverbank 5:5 Male, we saw another leopard running in the distance. Upon closer investigation, it was the Vomba Young Female who was in hot pursuit of the male after hearing him call. We followed her for a few minutes as she tried to track him by scent, but when she heard him rasping again, she ran straight towards him. He wasn't quite as interested; he completely ignored her advances and by the following morning, they had parted ways. 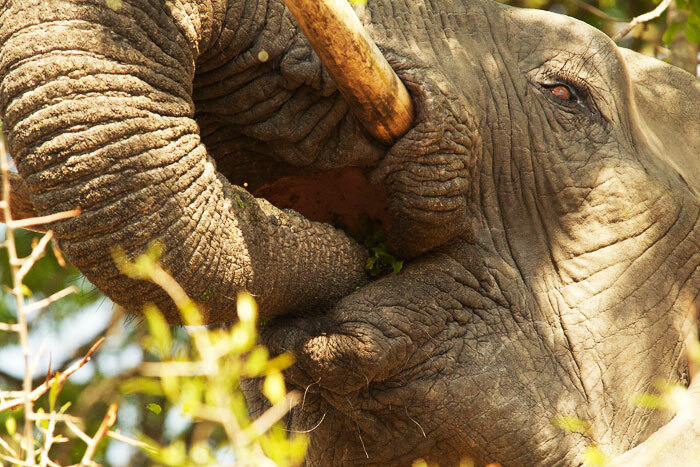 An elephant gave us an up close and personal glimpse of how they normally feed: using the trunk as an arm to grasp food and place it in their mouth. 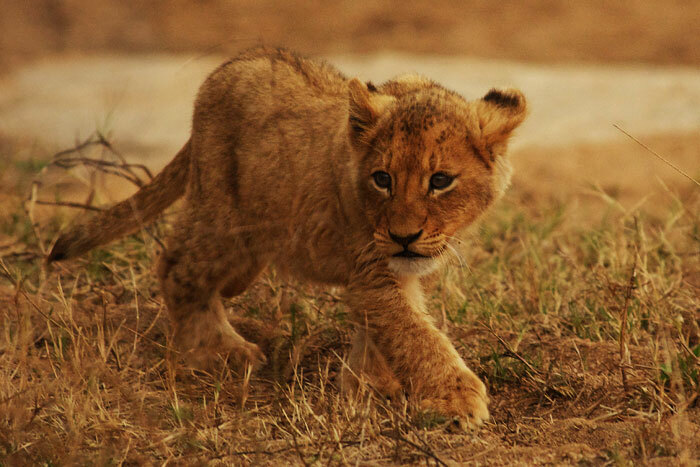 The Tsalala cubs seem to have taken up residence in the Sand River as of late! The lionesses have been very successful hunting around the river, so as the youngsters grow and become more confident, they have been kept closer to the action. 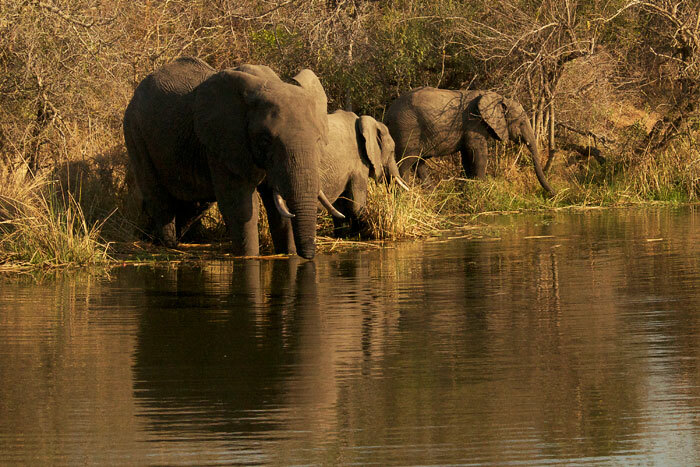 We have often seen them from the decks of the different Londolozi Camps this week. During the first lightning storm of the season, one of the smaller cubs worries about the thunder. One can understand why, as this would have been the first time they have experienced a storm in their lives. 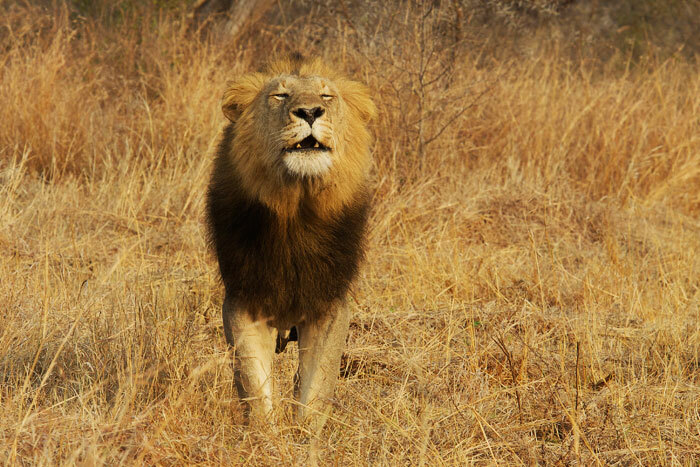 One of the Majingalane Males roars just after sunrise, proclaiming his territory. All four males came together on Londolozi this week, marking the first time in months they have been viewed as one Coalition (this was my first time to view them all at once - although they were never close enough to one another to get a photo!). 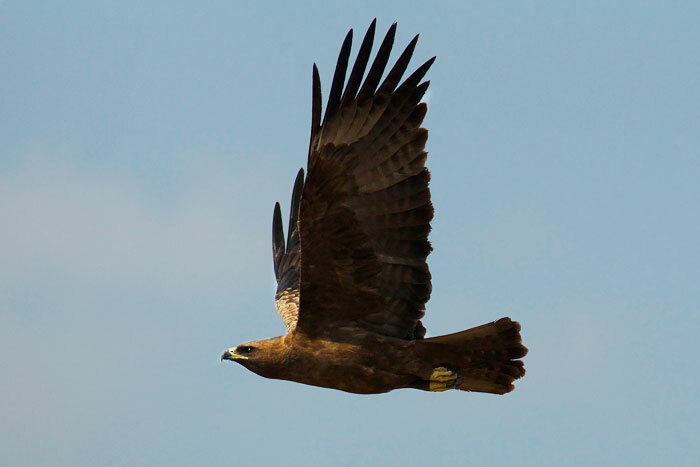 A Wahlberg's eagle. The birds are just beginning to arrive back from their migration, and are already getting their nests in order. 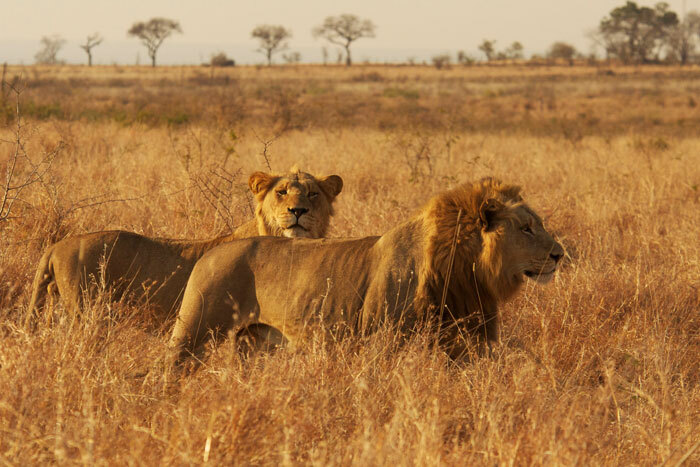 The South Pride Males walk purposefully across the open plains of southern Londolozi. This was to be the start of a dramatic morning. One of the males walks away from a pan after having a quick drink in preparation for their hunt: they had spotted a herd of buffalo in the distance. Perhaps analyzing their tactics, the South Pride Males look at the buffalo herd. 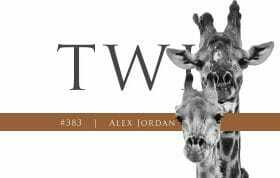 They would disappear into the thicket between them and the herd, spread out and crouched, while we waited for the outcome. 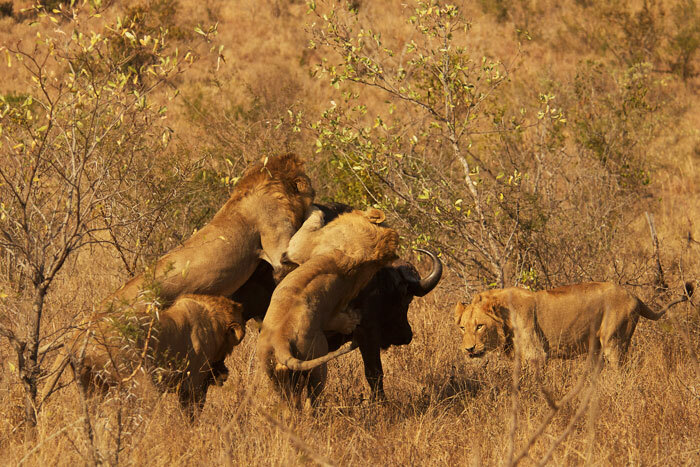 In a sudden burst movement, the South Pride pounce on an older buffalo who had dropped back from the herd. 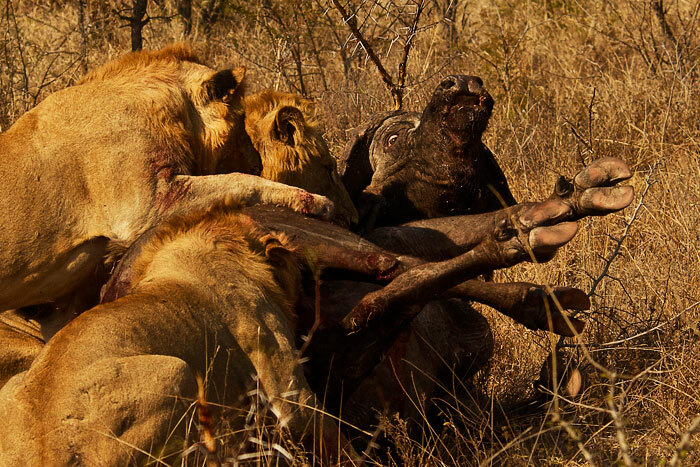 After a struggle, the buffalo collapses under the weight of the lions. 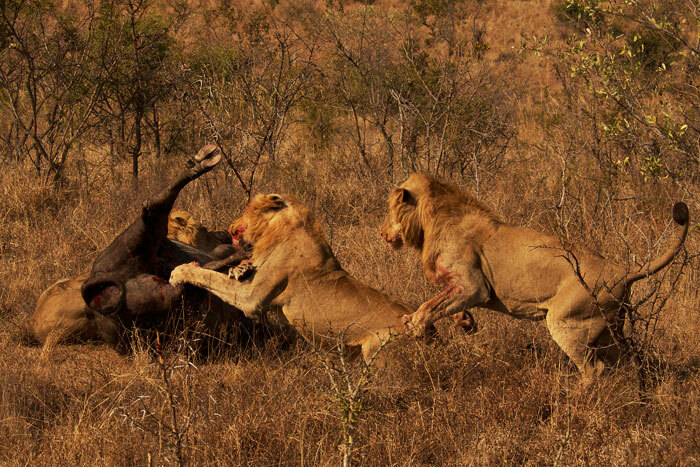 Never animals to go down without a fight, the buffalo rolls over, kicking one of the lions. Another tries to pin down the head in order to suffocate it by covering its nose with his mouth. 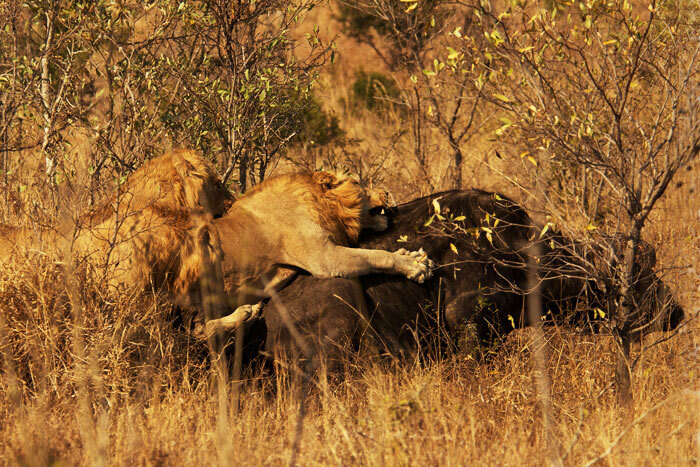 The buffalo gives everything it has to defend itself from the lions. 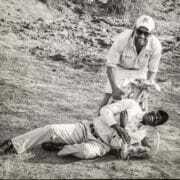 It took about 35 heart-wrenching minutes for the buffalo to finally die, from the time the lions brought it to the ground. 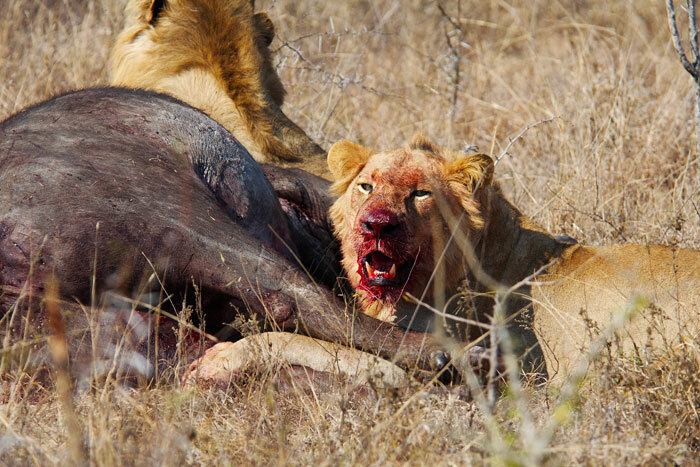 For the South Pride, the struggle was worth it: they fed for the following four days on the carcass. Talley…is that Shayne, or one of his siblings? I’m not as adept at telling them apart as you are, but I know he/she is one of the fab four. Just too cute. 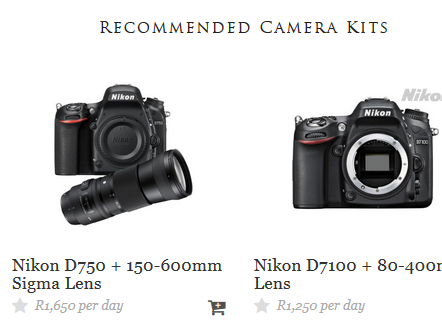 The photos of the kill are fabulous…next time I hope to see one first hand. That sunset is to die for! Thanks so much, sometimes I also can’t believe how much unfolds in only a week! Some fantastic pictures showing the lives of these amazing animals. I wish i could be a fly on the wall in the bush and watch all the events unfold. These daily updates are always great to read and the first thing i do after morning briefing at work. Pure bliss! 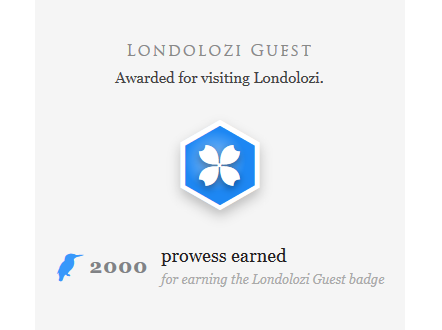 How many different prides roam the llondolozi reserve? I have become a big fan of the majings and i hope they are keeping well. Hi Jamie, as you can see from Rich’s response, the answer is a bit complicated! 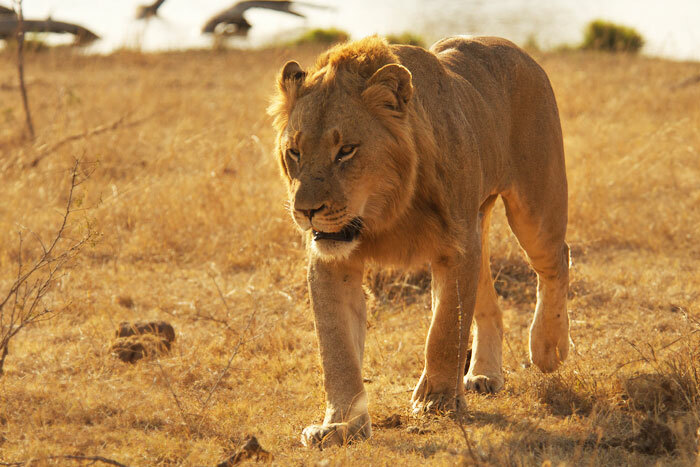 The groups of lions we view the most frequently are the Tsalala Pride (with the 8 cubs), the Sparta Pride (the 5 females), the Majingalane Coalition (4 males), and the South Pride Young Male Coalition (4 males). But it is constantly changing as territories shift and drama unfolds! For example, yesterday the Mapogo Coalition (3 males) chased the South Pride Young Males from the Sand River far south on Londolozi. And about 3 days ago, the South Pride Young Males killed one of the Othawa Young Males. 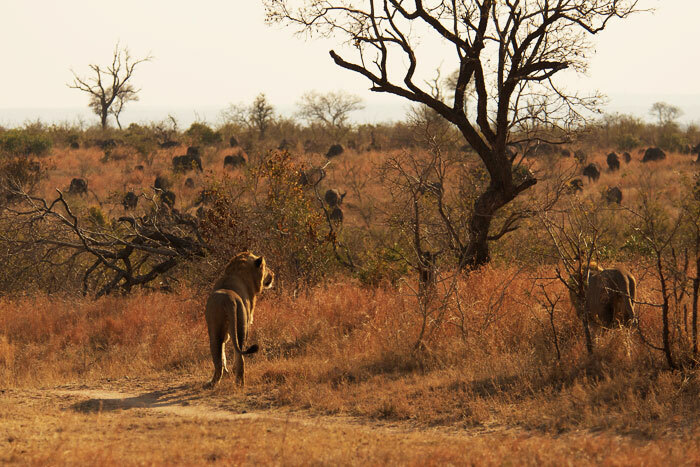 Plus reports of the Matimba Coalition (6 big males) coming south towards Majingalane territory… lots of testosterone around, we’ll try to keep everyone up to date! Well done Tal! 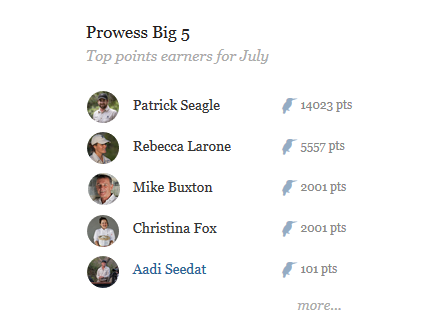 Another pearler week. Those buff kill photos are insane!! 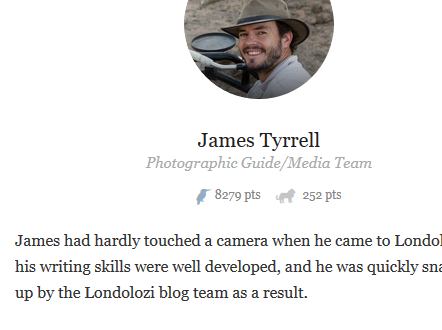 I am extremely envious as well James! We watched what seemed like hundreds of buffalo cross the river beneath us, while we enjoyed a lovely picnic in the ‘tree house’ (It was WONDERFUL, THANK YOU!!) There was 1 male, bringing up the rear, last to cross…it was sad at to watch at first, but a noble effort; he seemed to accept his place, now, trying to keep up, realizing he was literally bringing up the rear and still he stayed with them. They all have a role and they do it admirably, right through the end. I have much respect for the elders! Hi Geri, the ‘tree house’ or Lookout as we call it is an incredible experience and you were certainly very lucky to have the buffalo visitors! 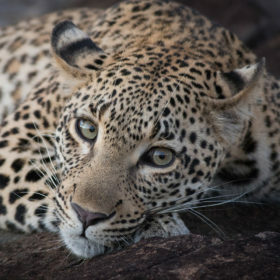 Just a few days ago, the Tsalala Youngsters were feeding on a kill just beneath it, and the Tutlwa Female (leopard) has been seen quite frequently around there. As for the buffalo, there are definitely distinct roles played amongst the huge herds, and the old boys who follow at the back usually play a defensive role as well. Unfortunately for this one, he was a little too far behind and his herd-mates too far away to help him in time. Thanks Jess!!! I think you need to get the ranger uniform out and come live the dream!! The bush misses you! I am amazed at the quality of your pictures every single week. 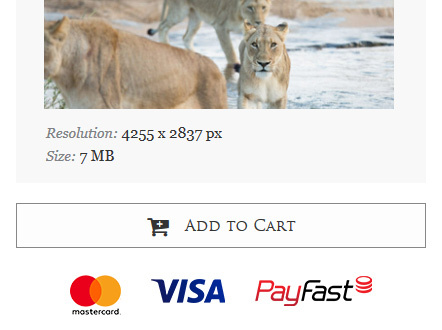 The quality of the game viewing at Londolozi. And the quality of your guiding team. An absolute treat. 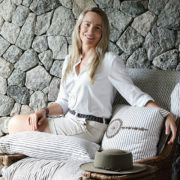 Thanks Penny, I feel very lucky to be in a place with such incredible energy, passion and respect for nature. 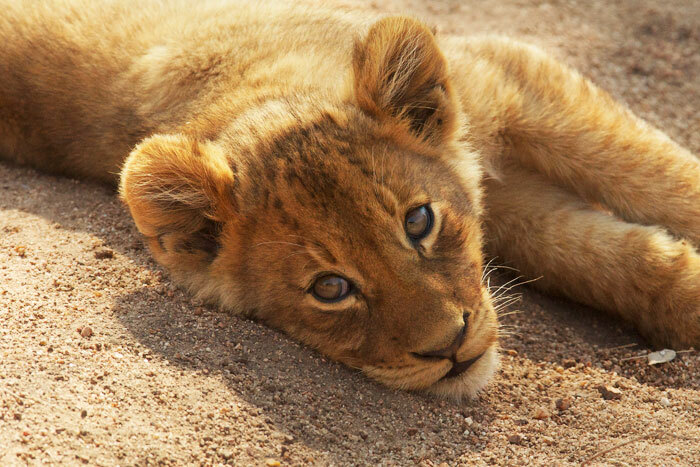 Great pic of the frightened lion cub! I understand the older four are three girls and a boy. How about the junior members? Thanks Danny, it was so interesting to watch the youngsters experience a ‘first’ in their lives. Loved the pictures. 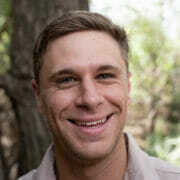 I grew up in the Bushveld and it is one of the two places where I am totally at peace. 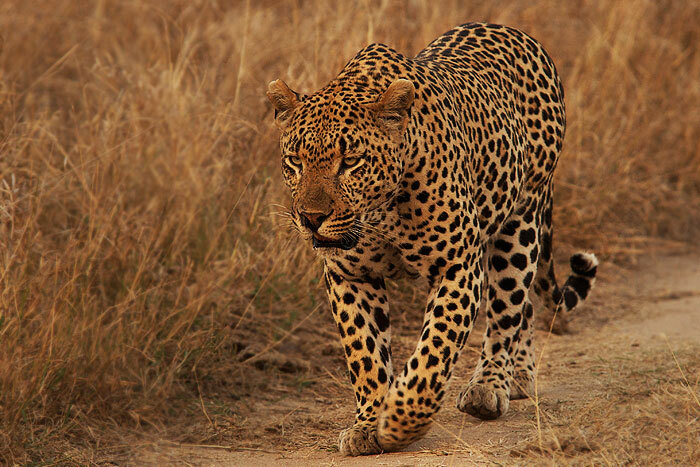 Leopards are my favourite predators, they are remarkably beautiful….beauty with an edge. Remarkable pics. 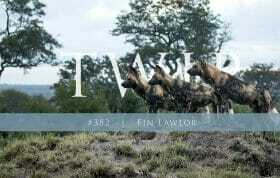 But it intrigues me that the 3 Mapogos do venture from time to time, back into Londolozi. 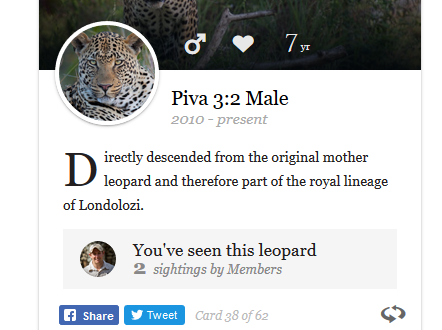 Was wondering about that as, in the weekly sightings, there was a recent pic of a Mapogo lion drinking from a source in Londolozi. Could you shed some info on clever movements of rival coalitions within such close proximity to each other? WOW Breathtaking photography Talley! 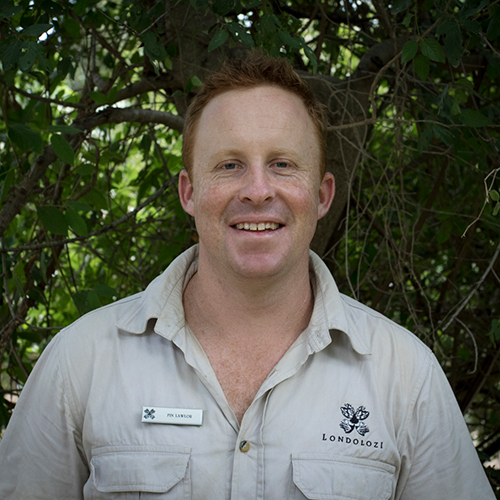 That Boomslang looks pretty “vicked”! 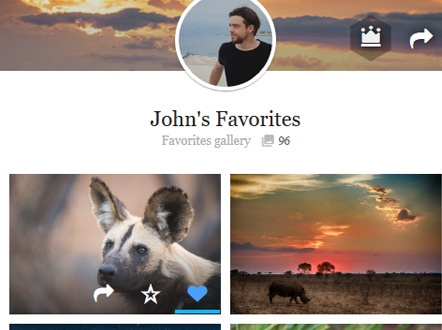 from the sunset photo to the buffalo kill, I feel like I was right in the bush with you Talley! Fantastic storytelling and amazing photos! 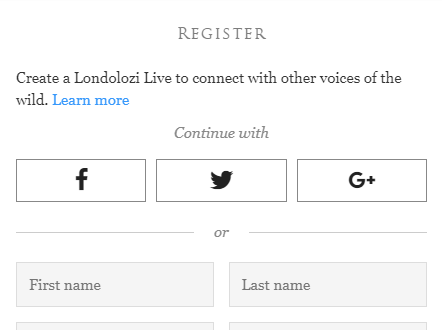 I can’t tell you how much I look forward to these blogs! Awesome blog…..just catching up on some I missed. 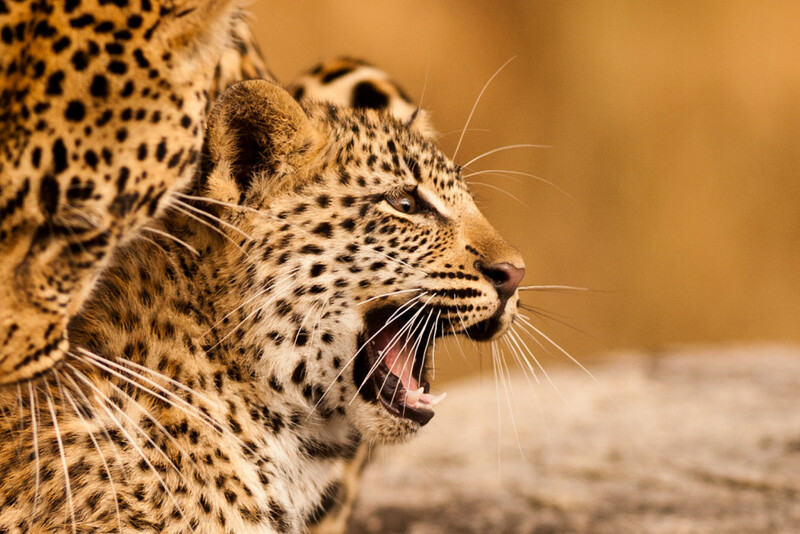 The Southern/Selati young males are looking good! 🙁 too bad I know the outcome of somethings though.